Variegated floss is a great way to add dimension to your next project. You might think that variegated floss is just like every other floss, but it isn't. There are techniques and tips to using this floss that will make your final project stand out from the rest. The stitching method you use depends on two things: the look you wish to achieve, and how the color is spaced on the thread. For example, let's take a tree. If you are using a brown-black variegated for the trunk. Because a tree grows vertically,You will be stitching in vertical columns rather than horizontal rows. All these methods display some level of striping/shading. Trees, garments, hair, and other vertical shapes look odd when they have "horizontal stripes". But how "stripe-y" do you want it to be? You need to thing of the way patterns occur in nature and use the floss accordingly. The floss is a great addition for highlights and texture. For maximum color display you will want to separate your thread plies and reassemble them all in the original direction. Then cross each stitch as you go (English style). At that point, you can complete full columns individually, letting the colors play out naturally. Or, you can stitch sections of each column as the spirit moves you (creating patterns with the thread), until the whole tree trunk is stitched. The same techniques would apply for stitching a pond or river, only you would stitch horizontal rows instead of vertical columns. Separate your thread plies and reassemble them in the original direction for. a moderate color display. 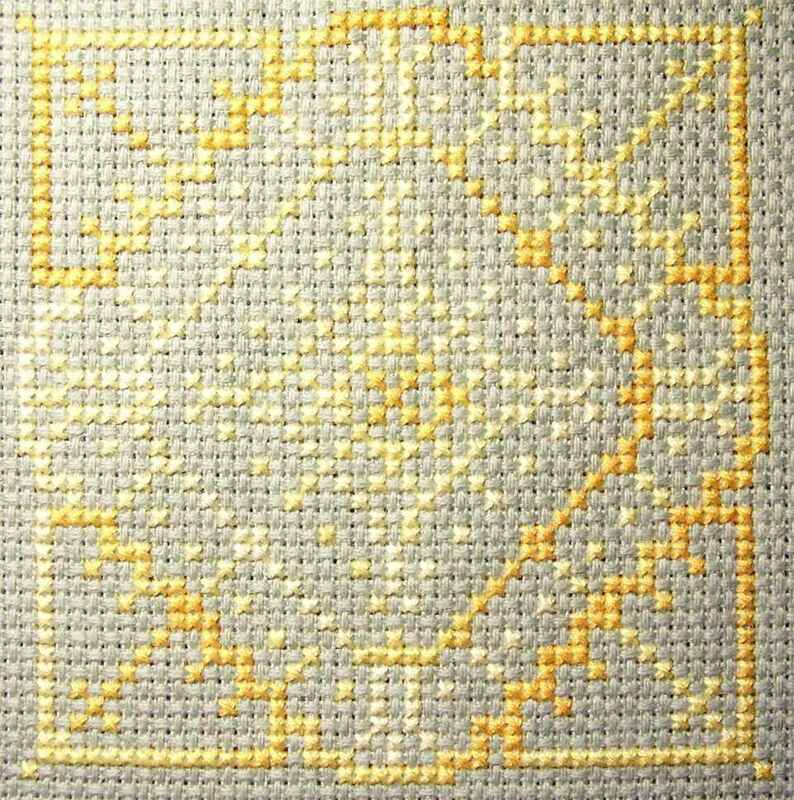 You can then stitch up and down or out and back completing your cross stitches only on the return trip (Scandinavian or Danish method). This will look more "speckled" than "stripe-y". With this method you can easily alternate stitches or stagger columns/rows, but staggering is hard to do without long thread-carries on the back. For Muted color display , again separate your thread plies, and reverse one or more of them. You can stitch in English style for greater color-play, or Scandinavian style for a softer, more-speckled look. An Iridescent color display is a little more complicated. You will need to stitch all the bottom legs in one color, then stitch all the top legs in another color. The term"iridescent" is being used because as the fabric or viewer moves, the eye will catch first the top legs then the bottom one, so the color will appear to "shimmer". Depending on how different the threads are, and whether the darker or the lighter thread is on top, you'll get even more unique looks from this technique. This is also an easy way to add sparkle to your design without having to use blended threads in the needle - just use your metallic or blending filament for the top leg of the cross stitch. Teresa Wentzler recommends this technique for her complicated designs. Experiment with these techniques in advance on a piece of "doodle cloth", and keep notes of how you feel about the results. This will provide a reference for future designs which call for specially dyed fibers. It will also help give you the confidence to use these special fibers in designs which don't call for them. While these techniques are tips will help you along the way, remember that how your final piece looks is totally up to you. Use these ideas as a stepping board to try new ways of stitching. Don't be afraid to put your own spin on it. Never stress if you don't get the technique just right, have fun, practice, make it your own! As the saying goes: "Thread goes through needle. Needle goes through fabric. Everything else is a suggestion."